A seminar may have several purposes or just one purpose. For instance, a seminar may be for the purpose of education, such as a lecture, where the participants engage in the discussion of an academic subject for the aim of gaining a better insight into the subject. Other forms of educational seminars might be held to impart some skills or knowledge to the participants. Examples of such seminars include personal finance, web marketing, real estate, investing or other types of seminars where the participants gain knowledge or tips about the topic of discussion. Of course, a seminar can be motivational, in which case the purpose is usually to inspire the attendees to become better people, or to work towards implementing the skills they might have learned from the seminar. For instance, a business seminar with a financial theme could be for the purpose of teaching small business owners how to pitch to investors or to write a solid business plan, and to motivate them to get started right away. Sometimes, seminars are simply a way for businessmen and women, or other like-minded people, to network and meet other attendees with similar interests. Such seminars provide opportunities for the attendees to make some potentially valuable contacts that can help them move to the next level in their careers or endeavors. A trade seminar brings a wide cross-section of the community together, such as government officials, businessmen and women and the general public. 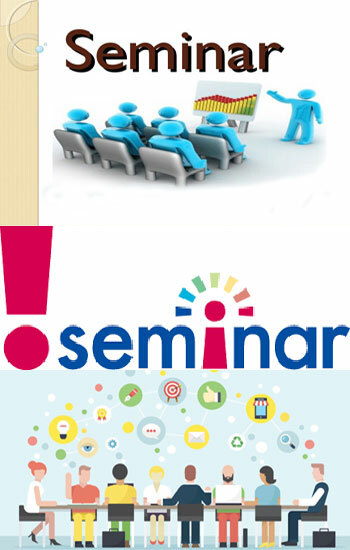 Such seminars often consist of workshops and the presentation of white papers. They are usually held for the purpose of networking with various vendors and making new connections.